This was another 7" not carried by my record store for Record Store Day, but luckily Interpunk came through gain with this one. As I'm sure you can imagine, this was a record very high on my priorities list because as soon as you add John Reis to anything, it becomes a mandatory addition to my record collection. The funny thing is, when you add John Reis to anything it also becomes an amazing record. I've tried to give Metz a chance in the past and while I wouldn't say they are bad, in general they're not my cup of tea. I've always found them just a bit too noisy. However, once you add John Reis to the mix, he can't help but bring a catchiness and a bit of a melodic undertone to whatever he is involved in. His addition instantly makes this 7" something I could listen to every day. The A side is "Let It Rust." It's built off of a fast changing, repeating guitar riff that wouldn't be out of place on some of the noisier moments of Reis' back catalog. But what really drives this song home is the back and forth vocals of the chorus that really bring together the chaos of the verse. I'd also be remiss to not mention the breakdown towards the end of the song that cements this as a top notch hit. B side "Caught Up" seems like it could very easily fit on any Night Marchers record. With its lighting quick guitar licks and abrupt changes in tempo, this song is dynamic to the point of almost being ridiculous. Reis has always been one of my favorite guitar players in rock and roll. I'll present this song as a definitive example of why. It's just an incredible song. 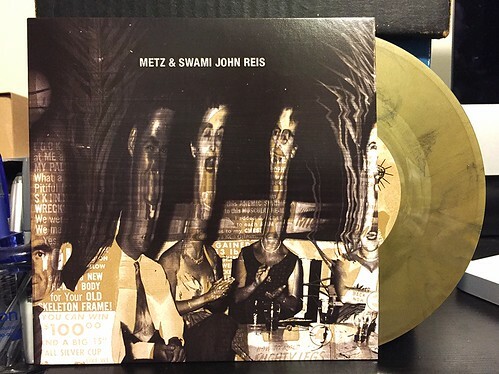 I'm not sure what the future holds for the Metz and Swami John Reis working together, but I really hope they reconvene for a full length like John did with The Blind Shake. At this point, I'm fine with you adding John to just about any band. Whatever it takes to get me more records.